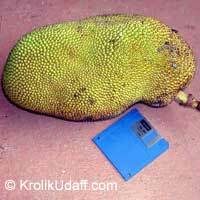 Ma'afala Breadfruit, seedless variety, one of the finest eating of all breadfruit. Vigorous and prolific. 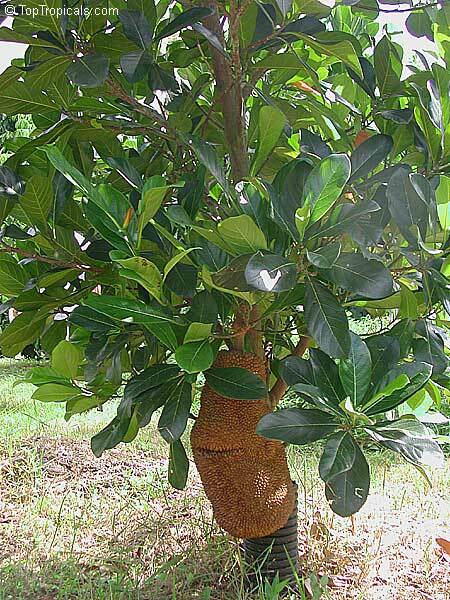 This tree produces up to 200 fruit per year. The moist inner pulp of the fruit is eaten after cooking, and has the taste and texture of potatoes. 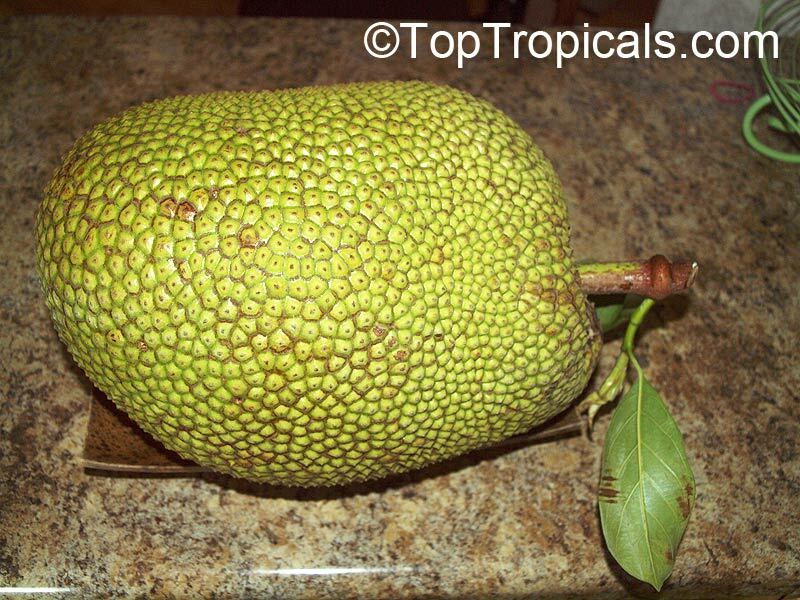 Jackfruit (Jakfruit) Borneo Red - variety with crunchy orange-reddish colored flesh. Jackfruit is the largest tree-borne fruit in the world, reaching 80 pounds in weight and up to 36 inches long and 20 inches in diameter. The interior of the fruit consists of large edible bulbs of yellow, sweet, banana-flavored aromatic flesh that encloses a smooth seed. As the fruit ripen at the bottom of the trunk, this tree can be (and should be) pruned annually to 12' x 12' producing as much as 200 Lbs. The plant requires organic soil and regular water. Mature trees can tolerate some frost, smaller plants must be protected. 5367 Artocarpus heterophyllus - Jackfruit Cantaloupe, grafted ? Cantelope is the darkest but semi-soft (more firm than black gold). It is rounded and usually weighs about 20lbs. This is a good fruit variety to dehydrate, because the arils lay flat on the tray and the chips are like pure sugar. Also has low latex. Jackfruit (Jakfruit) Crispy. It is relatively low latex, crispy but not too crunchy, thick fleshed and very juicy. Will fruit in 2-3 years in optimal conditions. 6241 Artocarpus heterophyllus - Jackfruit Echo, grafted ? Very good Fruit between 15-25lbs. The tree is vigorous and with regular pruning can be maintained at a height of 8-10 ft. 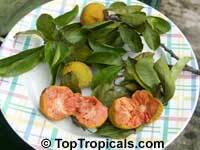 The flesh easily removed from the fruit comparing to other cultivars. Fruit ripen in Fall in Florida. 3498 Artocarpus heterophyllus - Jackfruit Gold Nugget, grafted ? Jackfruit (Jakfruit) Gold Nugget - sweet aromatic variety with bright golden color. This variety was selected in Australia. The tree is fast growing with dense, spreading canopy. It can be easily pruned to maintain small tree around 8 ft tall. 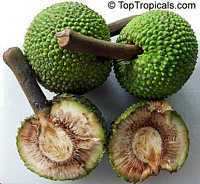 The fruit are small (about 7-10 lb), greenish-yellow and rounded. The deep orange flesh is excellent and has no fiber. The flesh is soft to medium firm depending on ripeness. 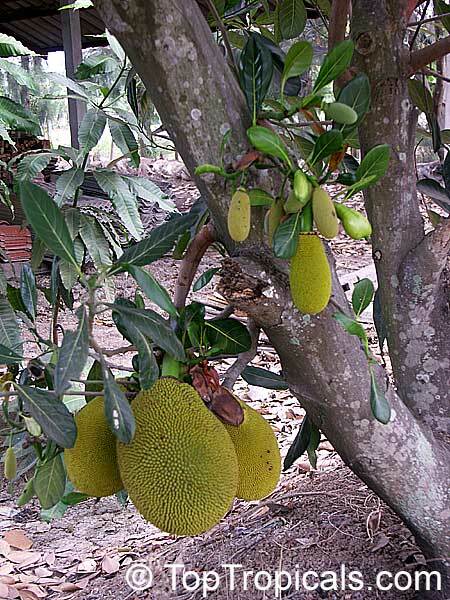 Golden Pillow (Mong Tong) Jackfruit (Jakfruit) originated in Thailand. Considered one of the best Thai cultivars. The tree is small and easy manageable at a height of 8-10 ft. 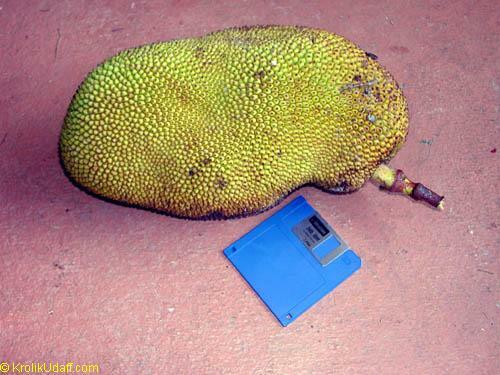 The fruit has blocky shape, weighting 8-10 lb. 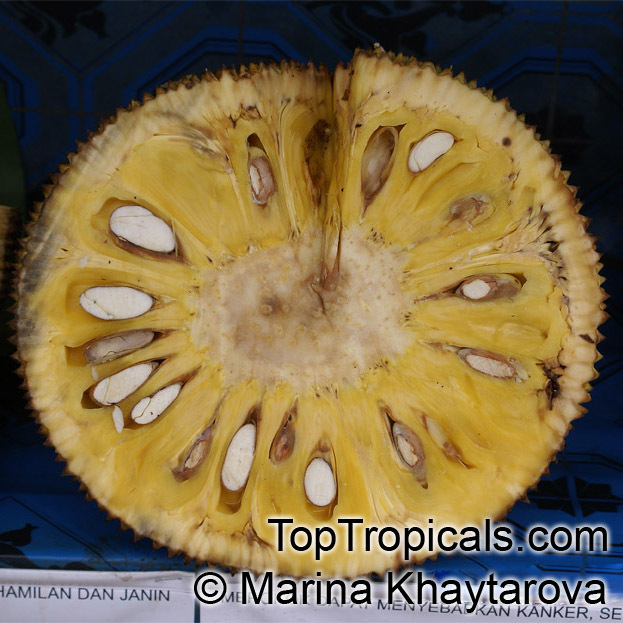 It has golden color with fleshy spines, which flatten and open as fruit matures. The golden color flesh is thick and crunchy. The flavor is mild and sweet with musky aftertaste. 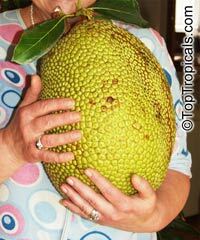 5221 Artocarpus heterophyllus - Jackfruit Honey Gold, grafted ? HONEY GOLD: Can be maintained to small tree with pruning. Yellow to orange flesh, with a sweet, rich flavor. 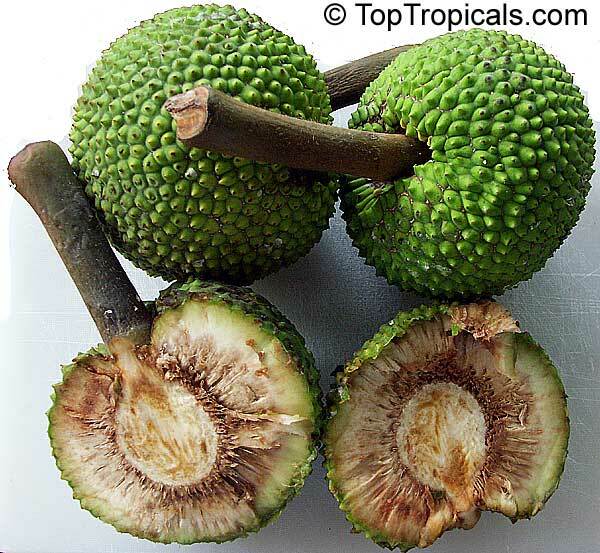 The fruit as basketball sized round when ripe and it fruits on the many limbs instead of just the leader. Compatible in texture and flavor to the Gold Nugget with a dwarf growth habit and fruit. Mid, July-Aug fruiting season. 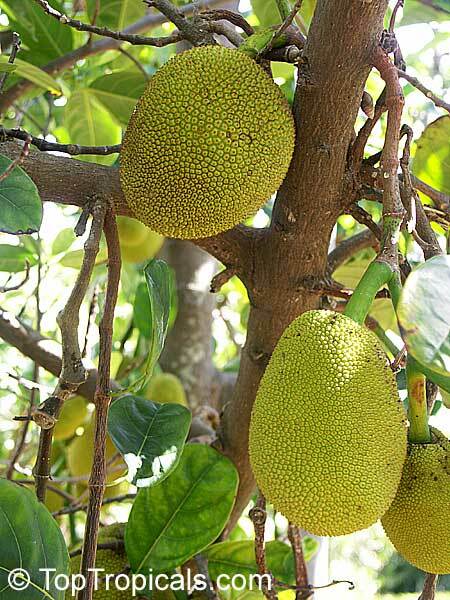 Jackfruit (Jakfruit) Lemon Crunch. It is relatively low latex, but not latex free. Crispy but not too crunchy, thick fleshed and very juicy. The flavor has a nice sweet and lemony character. Will fruit in 2-3 years in optimal conditions. 5222 Artocarpus heterophyllus - Jackfruit Lemon Gold, grafted ? 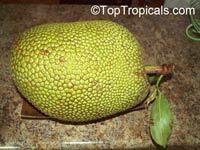 Jackfruit (Jakfruit) Mai-1. This Thai variety has oval 25-35 lb fruit; the flesh is extra crispy. Fruit can reach 25 to 30 lb with a golden-yellow skin color. The flesh is crisp, sweet and delicious, with little latex. The tree can be maintained at a height and spread of 8 ft.
NS-1 Jakfruit (Jackfruit) was selected in Malaysia. The tree is dense, upright, with moderate vigor. Dense, upright, moderate growth habit. Can be maintained at about 10 ft tall with moderated pruning. The fruit is dark green and blocky. Mature fruit has flattened spines. Fruit weight is up to 10lb. The flesh has dark orange color and firm. Sweet rich flavor with excellent texture. 5357 Artocarpus heterophyllus - Jackfruit Orange Crush, grafted ? 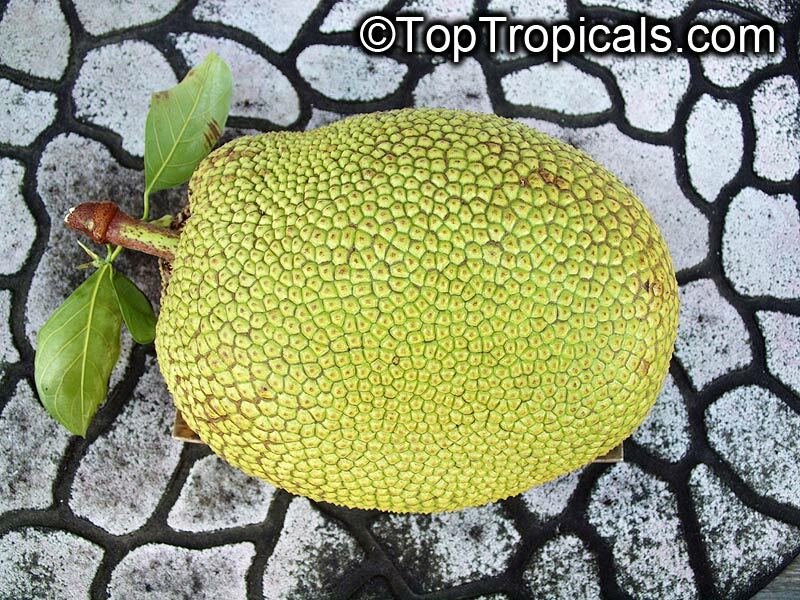 Jackfruit Orange Crush has a dark orange, extra crunchy flesh, with a nice clean green skin, and low latex. Typically weighs about 20lbs. 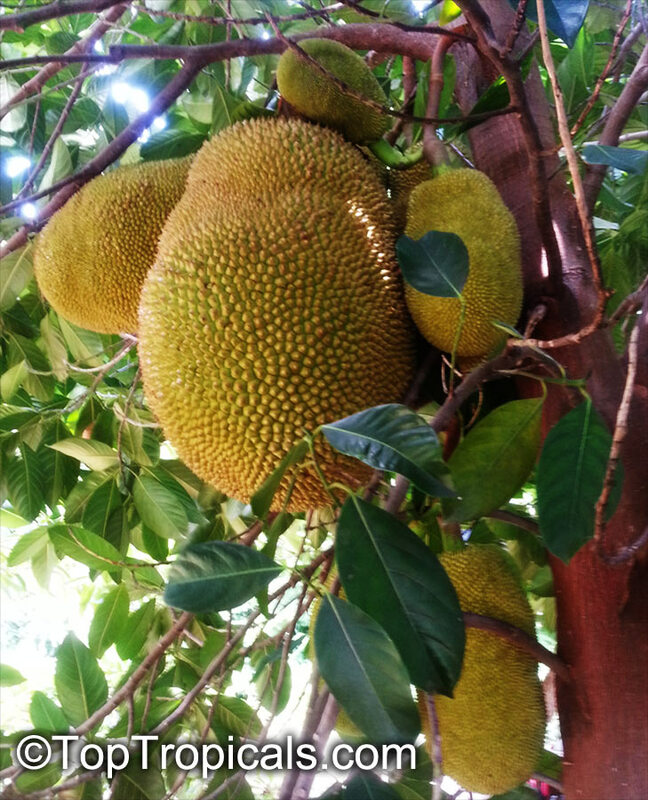 Jackfruit is the largest tree-borne fruit in the world, reaching 80 pounds in weight and up to 36 inches long and 20 inches in diameter. The interior of the fruit consists of large edible bulbs of yellow, sweet, banana-flavored aromatic flesh that encloses a smooth seed. The plant requires organic soil and regular water. Mature trees can tolerate some frost, smaller plants must be protected. 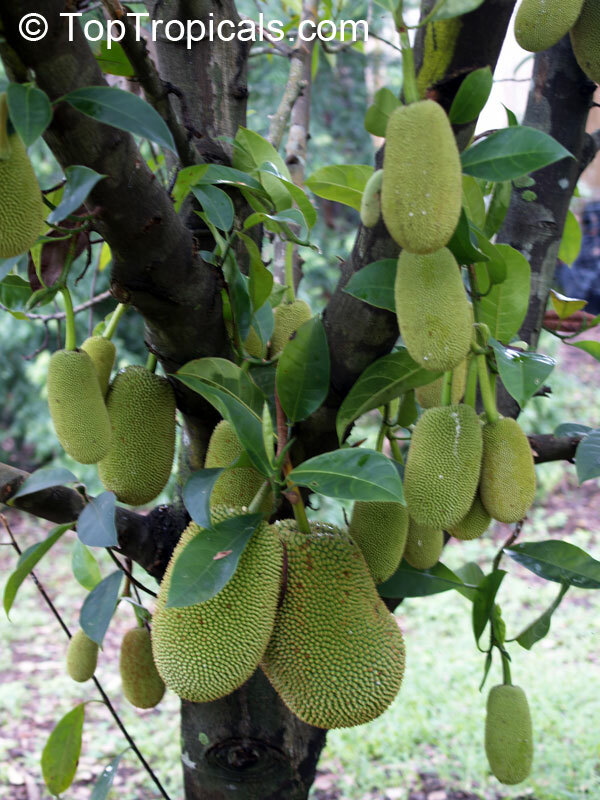 Jackfruit (Jakfruit) is the largest tree-borne fruit in the world, reaching up to 80 pounds in weight and up to 36 inches long and 20 inches in diameter. The interior of the fruit consists of large edible bulbs of yellow, sweet, banana-flavored aromatic flesh that encloses a smooth seed. As the fruit ripen at the bottom of the trunk, this tree can be (and should be) pruned annually to 12' x 12' producing as much as 200 Lbs. of fruit per year. Seedlings start fruiting within 3-4 years. The plant requires organic soil and regular water. Mature trees can tolerate some frost, smaller plants must be protected. 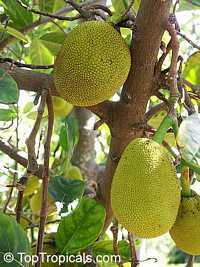 This variety features are described by its name: it has a smaller 8-10" fruit that weighs 4-6 pounds, and the tree has a dwarf habit. 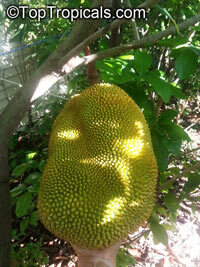 It is a perfect Jackfruit for container culture. 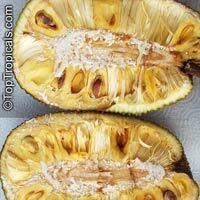 The fruit is sweet and aromatic and has very little latex which makes it easy to handle when opening the fruit. 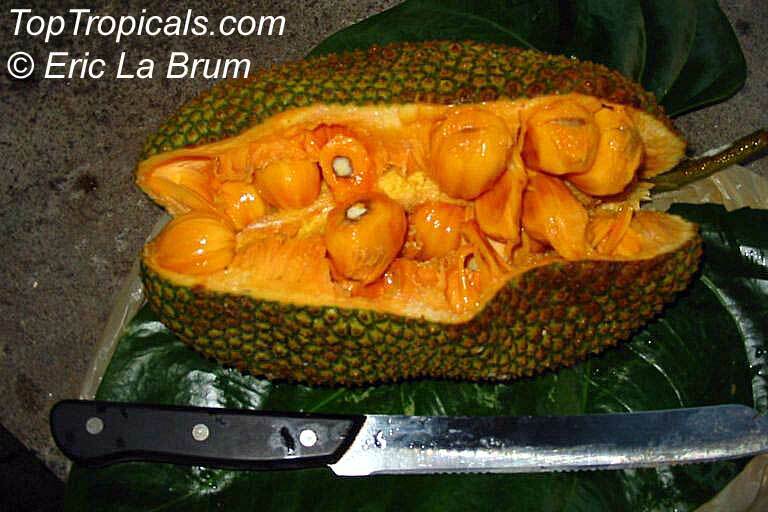 Jackfruit (Jakfruit) Zima Pink - Hawaiian variety with crunchy dark-orange-pinkish colored flesh. Round medium-size fruit with very thick flesh has excellent taste. Kwai Muk - very rare. 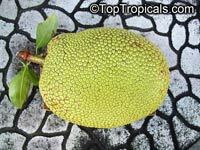 The round fruits have a velvety, brownish, thin, tender skin. They say it is the ugliest fruit but the best flavor! Marang, Tarap. Rare tropical fruit related to Jackfruit. Delicious! 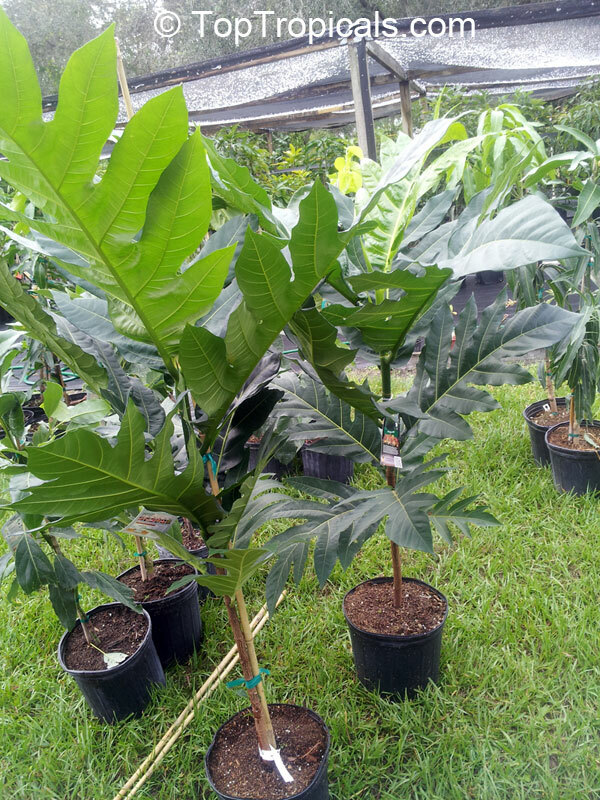 One of the most delicious tropical fruit and beautiful exotic tree with large lobed leaves. 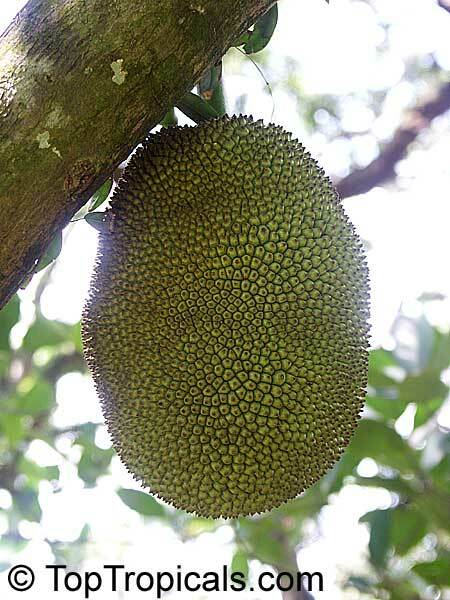 The fruit is as big as 10-12", soft flavored, can be appreciated from the first bite and considered superior in flavor to both Jackfruit or Chempedak. 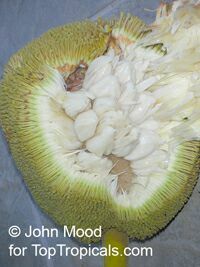 Being a cold sensitive plant, Marang can be grown in container inside a greenhouse, where it will enjoy high humidity. The seedlings grow rapidly, first fruit can be expected within 3-4 years. 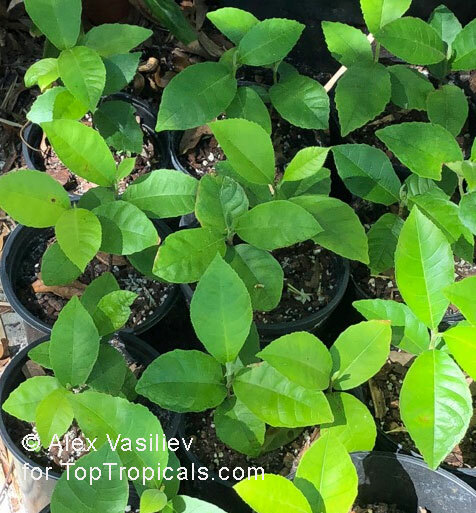 This highly recommended variety has grown in TopTropicals garden from a seedling of Cheena (Jackfruit x Chempedak) that fruited within 3 years from planting. The fruit (20-25" size) is probably the best we ever tasted! It is super sweet, crunchy and has a rich, pleasant, excellent flavor. It has very little latex which makes it easy to handle when cutting up. 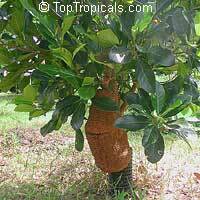 The tree produces at the very base of the trunk, so you can prune it as short as you want. Our tree survived light frosts as well as 48 hours of 3ft flooding, with no damage! 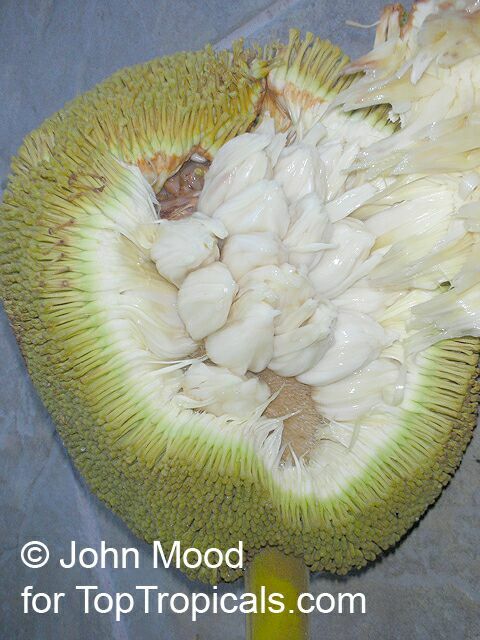 Cheena is a natural hybrid between jackfruit and chempedak. The tree has an open, low and spreading growth habit and can be maintained at a height and spread of 8 ft with annual pruning. Cheena is a consistent producer. 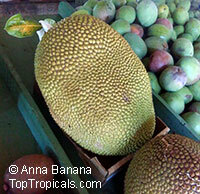 The fruit are up to 5 lbs, long, narrow and uniform in size and shape. The skin is green, with blunt spines that yellow and open slightly upon maturity. FRESH SEEDS! Cheena is a natural hybrid between jackfruit and chempedak. Comes true from seed.